Organised with seemingly limited resources, this privately sponsored exhibition nevertheless serves to introduce a non-Russian audience to a very unfamiliar group of artists working in truly challenging conditions. These 22 artists who attempted to build careers during an era of totalitarian government and a prescribed national style, Socialist Realism, laid down by Joseph Stalin from the early 1930s. As late as 1974, artworks by many of these artists who attempted to exhibit to a public audience faced state sponsored vandalism when work was destroyed during the infamous ‘Bulldozer Exhibition’ of 1974, an open-air show on the edge of Moscow. It seems now remarkable that art could represent such a visceral threat to the Communist Party and its ideology. But this tension between approved art and the deep instinct for private expression explains how and why so many of the artists in ‘Breaking The Ice’ continued to make art despite the enormous difficulties in building a career, earning a living and avoiding official harassment. We learn from this show of diverse interests and strategies under the rubric of ‘non-conformist’ art. Moscow functioned as the centre of an empire governed by a unifying political ideology and goals. As such, the city provided a hub for many migrants working in cultural activity. Even in a state of repression and limited possibilities for expression, the city facilitated debate and experimentation within non-conformist circles. Many of the artists exhibited here trained in the same academies and later acted as teachers and mentors to a new generation. Vladimir Nemukin was trained by teachers who had belonged to an avant-garde generation in Moscow immediately following the revolution. His abstract paintings took inspiration from American counterparts who exhibited during the Khrushchev thaw of the late 50s. ‘Spring In The City’ glows with yellow and white splashes as if they are electric beams within murky twilight. The brushwork is precise, building up patches of interlocking colour in that Expressionist ‘all-over’ effect. Sometimes a palette knife seems to cut through the wet paint to create delineated structure in the image. But this is less the sweeping assertion of Pollock and more the conscious, patient accumulation of detail found in the work of Joan Mitchell or the French artist Nicolas De Stael. By contrast, Oskar Rabin employs a painterly treatment reminiscent of Soutine or Chagall. The city is described as alienating and hostile environment. Resembling expressionist work of the 1920s, Rabin illustrates a train emerging from a sagging tunnel beneath tower blocks that totter and sway under their own weight. Melancholia runs as a consistent thread through these sombre pictures denuded of dynamic colour. A violin sits forlornly on crumpled newspaper. In another painting, a fish rests on a cross functioning as a table assuming and you can almost smell its decay. These are private meditations on a dystopian experience of contemporary life imbued with a romantic longing for escape embodied by the picture of a solitary passport. Contrasting responses to national and ideological decay might be seen in the work of Mikhail Roginsky who elevates the humble object to scrutiny. A green enamel cooking pot suggests a domestic history of utility and nostalgia. This is a variant of Pop Art without the commerce. Another picture uncannily resembles a Duchampian readymade but its pretence to a functional object is wryly subverted by its small size. Yevgeny Rukhin addresses private memory by copying the graffiti from his childhood hallway in ‘The Wall’. This incorporates lived experience into the painting and subtly alludes to imperfection and the shabby details of human activity. The painting revives private memory and a domestic arena free from public intrusion or control. Ilya Kabakov has acquired an international reputation for his conceptual installations and seems to have used adversity to forge a distinctive voice that plays well beyond the Russian context although a work like ‘The Artist’s Despair’, simulating an act of vandalism by an imaginary artist against his own art, is rather laboured. Furthermore its date of 1994 is one among several in the exhibition stretching beyond the ostensible Soviet context and made well after Kabakov left for New York in 1989. Elsewhere in the show we encounter works reminiscent of De Chirico and Morandi, still lives that investigate both the uncanny and the sublime but it’s the Sots Art (an abbreviation of ‘Socialist Art’) at the conclusion of the show that leaves the strongest impression. Perhaps it’s the courage and conviction with which artists like Komar and Melamid address the prevailing taste and ideology of the system. Their deployment of mockery and irony demonstrate the moral bankruptcy of the Soviet system. 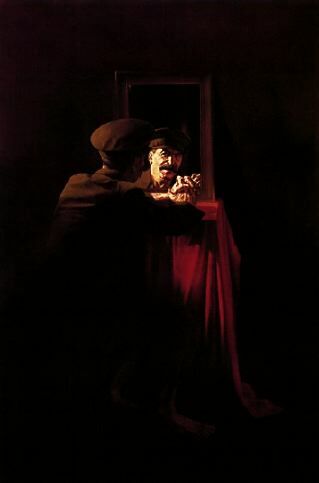 Stalin is presented like Hamlet staring into the mirror in a condition of existential anxiety. Kruschev meets Beria and is bathed in light like one of those Mannerist saints being blessed by divine favour. This is a world of insistent sloganeering reproduced in faux banners and posters. Only in the last years of Perestroika could Russian artists fully acknowledge their satirical intentions which we can identify in Alexander Kosolopov’s collision of Soviet and American iconography so that Lenin’s head is used as a new form of branding for McDonalds. Boris Orlov too makes a direct assault on the pomposity and pretensions of the Soviet military with busts topped by tiny heads and chests festooned with medals. These forms of iconoclasm are momentarily amusing but feel rather strategized. What impresses and endures from this show is the quiet dedication of artists who continued to develop their craft without opportunities to exhibit or sell work. As a consequence there is weight to many paintings on display here borne of diligence and commitment. ‘Breaking the Ice’ therefore provides an inspirational counter to much of the work being exhibited below in the exhibition of contemporary Russian art made in the past ten years, which is often flighty and insubstantial without the skills and discipline earned from adversity.